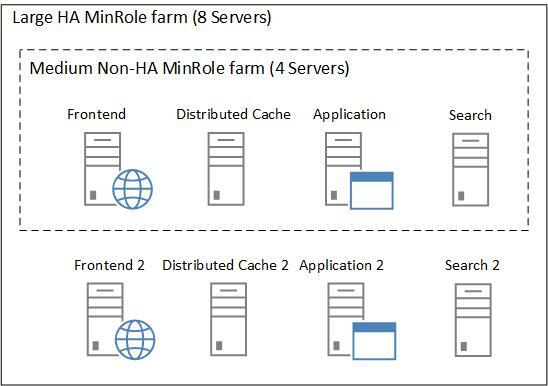 The following figure shows how a medium non highly available farm can be extended to a large highly available farm using dedicated server roles. This farm architecture is the ideal configuration to start with. 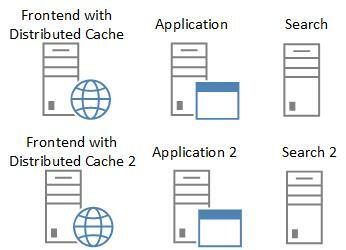 Depending on the load behavior, server roles can later be combined or extended by adding additional servers to support the individual usage scenario. Imagine you are operating a medium non-HA MinRole farm. You have implemented several search-intensive solutions that cause high load on the search server while the frontend server is operating at low load. In this case, you do not need to extend your farm directly to the large HA architecture. With the following configuration, you can take an intermediate step and achieve high availability of your farm by using only 6 servers. In the next scenario, your medium non-HA MinRole farm will be accessed by a large number of users. You have not implemented special search solutions or other applications. 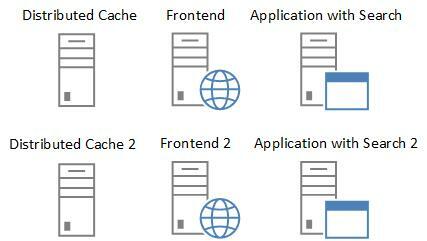 Your application and search servers are operating at low load, but the frontend is under heavy load. The following figure shows the configuration to solve this case. Again, you can achieve high availability of your farm by using only 6 servers and solve your high load problem.